Gliosarcoma is a mixed tumor consisting of gliomatous and sarcomatous components, each of which can be diagnosed independently of the other. Malignant gliomas comprise approximately 35 to 45 percent of primary brain tumors and are characterized by uncontrolled cell proliferation within the brain and resistance to conventional treatment strategies due to obstacles in delivering drugs past the blood-brain barrier. Median survival after therapy is up to 10 months. The SF-539 cell line was isolated from a recurrent, right temporoparietal glioblastoma multiforme of a 34-year-old white female patient after the treatment. According to the study published in Cancer Research, the SF-539 cell line expresses collagen type IV, fibronectin, laminin, and procollagen type III. In 2013 Albanese et al. published a study using malignant glioma models, including SF-539, to demonstrate the ability of PHA-848125, a multi-kinase inhibitor, to cross the blood brain barrier and exhibit anti-tumor activity. This drug was proposed for phase 2 trials and its mechanism of action is reported to affect the cell cycle progression via cyclin-dependent kinase inhibition as well as pathways mediated by tyrosine kinase growth factors. SF-539 serves as a glioblastoma model in the National Cancer Institute NCI-60 cell panel. The SF-539 cell line is used to create the CDX (Cell Line Derived Xenograft) SF-539 xenograft mouse model. 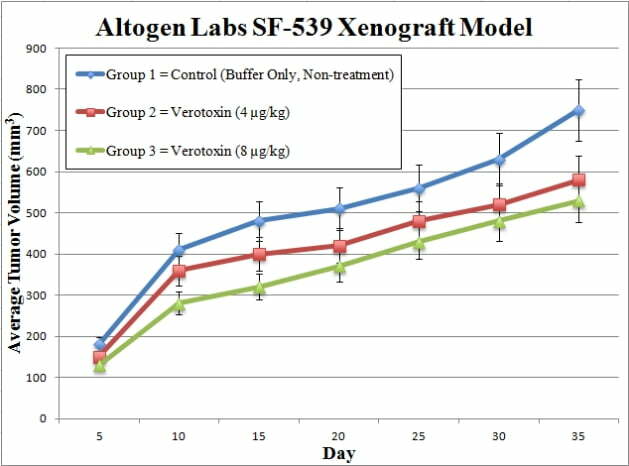 The SF-539 xenograft model enables a platform to test the anti-tumor efficacy of mono- and combination therapies (e.g. temozolomide, PHA-848125, radiotherapy). SF-539 cell culture is maintained under conditions of exponential growth. Each mouse receives a s.c. inoculation in the flank of one of the hind legs containing one million cells. The 100 microliter injection volume contains Matrigel plus SF-539 cells. The sites are palpated three times weekly till tumors are established. Tumors are measured (via digital calipers) until an average size of 50-150 mm3 is maintained and then animals are arranged into cage groups. Injection of all compounds of interest are performed following manufacturer instructions. Tumors measurements are taken on a daily basis, with accompanying mouse body weights recorded 3 times weekly. At the end of study, animals are euthanized humanely. Tissues are collected as defined for the termination of experiment. All tumors are excised and weighed; digital imaging is available. Tissues are collected for downstream analysis and are stabilized in RNAlater, snap frozen or prepared for pathology/histological analysis. Xenograft animal models are used to assess the effectiveness of test compounds against specific types of cancer. New medicines are tested on staged tumor growths that have been engrafted via subcutaneous or orthotopic inoculation in an immunocompromised mouse or rat model. All clinically approved anti-cancer agents have been evaluated with conventional preclinical in vivo models. Xenograft studies can be highly complex, starting with the selection of the appropriate animal model, choice of tumorigenic cell line, administration method, dosing, analysis of tumor growth rates and tumor analysis (pathology, mRNA and protein expression levels). Altogen Labs provides an array of laboratory services using over 30 standard Cell Line Derived Xenograft (CDX) models and over 20 PDX models. Researchers investigating the role of specific proteins or gene products in regulating tumor growth can benefit from development of protein overexpression (genetically engineered to ectopically express proteins, tumor suppressors, or oncogenes) and RNAi cell lines with long term gene silencing. Altogen Labs provides quantitative gene expression analysis of mRNA expression (RT-PCR) and protein expression analysis using the automated Western Blot WES system (ProteinSimple).